MTA Bus Company and New York City Department of Transportation (DOT) implemented a new bus service with limited stops from Woodside and Jackson Heights to LaGuardia Airport, connecting five subway lines (E, F, M, R, 7) and the Long Island Rail Road to the airport via the Brooklyn-Queens Expressway, avoiding local residential streets. This direct service is over 40% faster than the bus routes that once connected Jackson Heights to LaGuardia Airport, saving riders roughly 10 minutes of travel time. 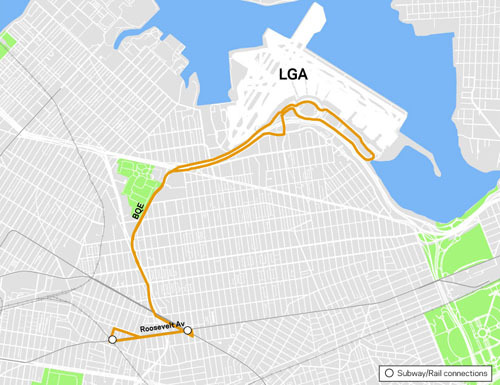 This route’s concept was developed as part of the LaGuardia Airport Alternatives Analysis and was implemented in 2013.